Patients with receding gums from Downers Grove, IL, are now welcome to receive the gum grafting alternative, Pinhole® Surgical Technique, from Dr. Amarik Singh at his Oak Brook, IL, location, with or without a referral. Patients with sensitive teeth are encouraged to schedule an appointment with Periodontal Implant Associates for minimally invasive treatment of gum recession. This revolutionary procedure is probably the most exciting aspect of soft tissue management and periodontal disease that I've seen in my 18-year career. Dr. Amarik Singh now welcomes patients, with or without a referral, to his Oak Brook, IL, practice for treatment of receding gums. Downers Grove, IL, patients with sensitive teeth can benefit from the Pinhole® Surgical Technique (PST™). 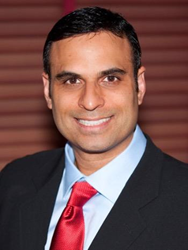 Dr. Singh is one of the elite dental professionals on forefront of revolutionary approaches to traditional procedures, including PST, a minimally invasive alternative to gum grafting for gum recession. Gum recession occurs for a variety of reasons, including aggressive tooth brushing, bruxism (teeth grinding), soft tissue trauma, and poor oral health, including the presence of gum disease. While changing habits can help slow its progression, gum tissue will continue to recede without proper treatment. Traditional measures, such as gum grafting, were the only solution for many years. Involving scalpels and sutures, gum grafting took gum tissue from the patient or a donor source and placed it over exposed tooth roots to rebuild up gum height and reduce elongated and sensitive teeth. Due to its invasive nature, especially in conjunction with use of patient soft tissue, gum grafting of multiple areas needed separate treatment in order for all soft tissue areas to heal. Today, patients can elect to undergo less invasive treatment with PST. The Pinhole Surgical Technique revolutionized the way in which receding gums could be treated. PST uses minimally invasive dental tools to shift existing gum tissue, eliminating the need for gum grafting altogether. During the procedure, a small hole is created in the gums above the affected teeth. A dental tool is used to gently loosen and reposition gums back down over the exposed tooth roots. Collagen strips are then placed to help keep the gums in place as they heal. Unlike traditional gum grafting treatment, which can take months, PST is highly convenient, allowing doctors to treat multiple sites in a single visit and with little discomfort to the patient. In addition, results are noticeable immediately, and patients commonly can return to daily activities on or the day after treatment. "We can, in a minimally invasive manner, perform a soft tissue grafting procedure to treat the recession without sutures or cutting. This revolutionary procedure is probably the most exciting aspect of soft tissue management and periodontal disease that I've seen in my 18-year career,” says Dr. Singh. Dr. Singh welcomes new patients with sensitive teeth to receive treatment with PST. Patients from Downers Grove, IL, with receding gums can call Periodontal Implant Associates at 630-424-9404 or visit http://www.pidentists.com to schedule an appointment.